A friend who enjoyed Lifeform Three sent me this article in Surrey Life. He was struck by my character Emma Greville, the original diarist of Harkaway Hall, who wrote of going to the seaside to find healthy air. Apparently I needn’t have sent her all that way because the very landscape in which she lived was so famous for its recuperative powers that it was known as Little Switzerland, and enjoyed by such luminaries as Sir Arthur Conan Doyle. More here at Surrey Life. 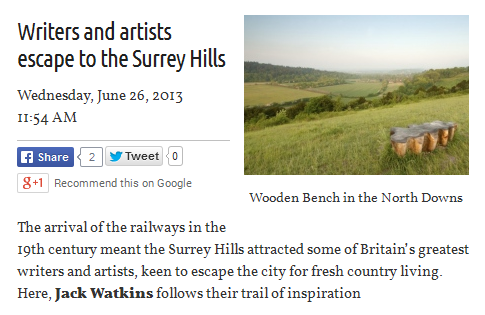 Find out more about Paftoo’s – and Emma’s – haunting landscape: Surrey Hills website.